Barriers meant to protect against major site failures are short-lived, while the threats persist for centuries. Mega-sized sites can be so massive that they would dwarf a hundred football stadiums, raising the consequences of site failures enormously. EPA’s regulations intended to protect the public and the taxpayer after the site is closed at best only cover minor costs for a limited time. After that, major site failures and taxpayer bailouts are inevitable at privately owned sites in non-arid parts of the country. Landfills in America today attempt to isolate the potentially polluting and hazardous wastes discarded from homes, stores and offices, which are typically piled up above ground in the shape of a pyramid. 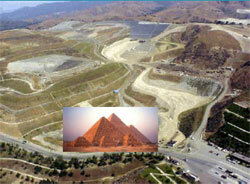 But, because these mega-sized landfills often extend over hundreds of acres and reach hundreds of feet high, they would dwarf thirty of the pharaoh’s great tomb at Giza. In an effort to confine the wastes inside a socalled “dry tomb”, EPA rules require these mountains of trash to be shrouded in a giant diaper. But, instead of using large stones like the Egyptians, the barrier today is the same thin sheet of plastic (the thickness of a credit card) common to the flat roofs of houses and about two feet of clay-like dirt. Also interspersed across the site is extraction piping intended to remove leachate, or garbage juice, which drains to the bottom, and capture gases generated from rotting food and paper. Unfortunately, perpetual care regimes are doomed. Like the rubber roofs on and plumbing in houses, the liners and pipes do not last forever, and when they fail – which is especially likely to occur decades in the future if the site is abandoned and no longer maintained – pollution will leak into groundwater, lakes, and streams and methane will be released into the atmosphere. 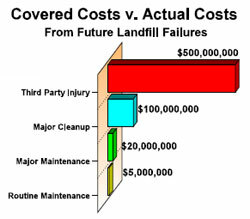 A landfill’s weakest link is its final cover intended to protect the site from rain and the elements after it is closed. This thin cap, which at the surface under a thin layer of dirt, is vulnerable to being breached any number of ways, such as from heavy rainfall, animals burrowing through and tree roots penetrating the seal. This is what EPA’s Inspector General found in 2001 was already happening routinely from storms and from pigs, bears and marauding teenagers even while the sites were still being managed, leaving little hope for their durability after postclosure care ends. 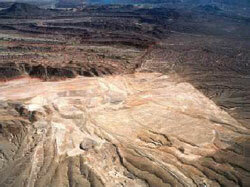 Tellingly, in 1998, a catastrophic cover failure occurred during heavy rains at the Sunrise landfill near Las Vegas. That failure discharged garbage, medical wastes, sewage sludge, asbestos, construction debris and soil contaminated with oil into the Las Vegas wash that feeds Lake Mead, which is the main source of drinking water for Las Vegas and Phoenix and parts of California. 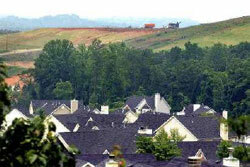 Republic Services, the landfill’s operator, vigorously opposed EPA’s order for long term remediation of the site, finally signing a consent agreement in 2008. Clean up costs are estimated at $66 million. (Interestingly, the company was able to afford to give its executives bonuses worth as much as twice that). 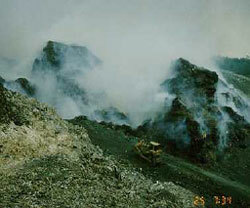 The fact that liners had this fatal flaw was not unknown to EPA when it decided to ground landfill safety on liners. The agency’s technical staff repeatedly warned about the flaw through the decade of the 1980’s leading up to the promulgation of its landfill groundwater rule in 1991. Even composite liners “will ultimately fail” within decades after the agency’s post-closure care requirements have expired, they advised, and when the liners fail, “leachate will migrate out of the facility.” Yet, its staff recognized, the duration of a landfill’s hazardous loadings that need to be isolated may be “many thousands of years,” long after the time when discharges will occur. 53 Federal Register 168, at pp. 33344-33345 (August 30, 1988). 46 FEDERAL REGISTER 11128-11129 (February 5, 1981). 46 Federal Register 28314-28328 (May 26, 1981). Chakravarty, Subrata, “Dean Buntrock's green machine,” Forbes; 8/2/93, Vol. 152 Issue 3, p. 96-100. Scott Walker and Robert Anderson, “Engineering Geology Overview of Municipal Solid Waste Landfills in Northern California,” Engineering Geology Practice in Northern California (2001), at p. 391. Depending upon the size and location of the landfill and the extent of the failure, clean up costs could run from tens to more than a hundred million dollars. Because the problem is systemic to many landfills, rather than being isolated to a single act of god, the owner of the landfill couldn’t possibly pay, even if he or she was still around and wanted to. Adding up clean up costs for hundreds of failed landfills and that puts taxpayers on the hook for tens of billions of dollars when, instead of an inheritance, the final landfill tab falls due on our children. 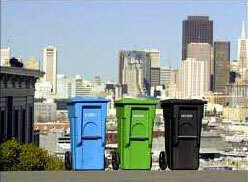 Further increasing the consequences of site failures are the suburbs sprawling around many landfills. A major collapse at a site where people live nearby does not just entail potentially more than a hundred millions of dollars in remediation costs to excavate, haul away and re-bury the exposed garbage somewhere else. 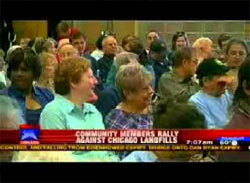 A disaster such as at the Rumpke landfill also raises an immediate threat to the landfill’s neighbors. Major site failures prefigure the morphology of a new and unrecognized failure mechanism raised at mega-fills near encroaching development with unprecedented cost implications that have been completely ignored by the regulatory process. When a landfill is closed, EPA’s landfill rules attempt to address this problem, but fitfully. Those rules do require the installation of a final cover after the site is closed. Also, for 30 years afterwards, the owner is required to provide financial assurances that there will be funds for routine care, and the owner is required to mow that grass and periodically check the monitoring equipment. However, no secure up-front funding is required for inevitable major maintenance expenses like replacing the cover as it deteriorates over time, nonetheless for corrective actions as the leachate pipes clog or for injuries to neighbors. Also, the assurances, by allowing corporate IOUs, are weak, and the time that care and those assurances extend is just a few decades when the threat persists for centuries. The chart along side compares the approximate $5 million of weak coverage under the rule, to the far greater expenses likely to occur over time. Remediation ignored. Also ignores the distinct possibility of needing to clean up massive and costly site failures in the event the cover is not rigorously maintained forever, as well as ignoring compensation for injured neighbors. Third Party Injuries ignored. 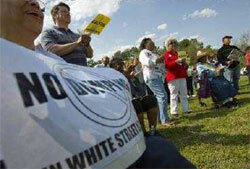 Similarly ignores the impact on the lives of the people living near the landfill after the facility is closed. Assurances limited. Confines financial assurances to just 30 years, and only for minor maintenance, with instruments, such as corporate IOUs (called net worth pledges), which fail to provide any real assurance anytime. John Skinner, “Composting and Bioreactors,” MSW Management (July/August 2001), at p. 16. Lanier Hickman, "No Guarantee," Waste News (January 20, 1997). John Trotti, “Editors Comments: Landfill Financial Responsibility: Whose Interests Are We Protecting Now?”, MSW Management (May/June 1998). There is no end-of-pipe “fix” with regulations for inherently dangerous facilities that require perpetual care – society is incapable of the task. Instead, the intractable problems need to be addressed at its source – that is the decomposable fraction of our discards that keep the contaminated site biologically active for centuries. As Europe mandated in 1999, and cities like San Francisco, Seattle and Portland are already doing, discarded organics like grass, leaves and food should be banned from landfills. For those living in communities without a strong commitment to zero waste, you can turn EPA’s failure to protect taxpayers to your advantage the next time a new or expanded landfill is proposed. The fact that large landfills leave enormous liabilities with the locality after they are closed threatens the communities’ economic viability along with its environment. Sometimes, that fact can reach more people than environmental concerns. To do this, go through the project application and find the section entitled Closure and Postclosure Care. There you will find the applicant’s promises to do the minor things required by EPA’s rules, which you now know barely touch the tip of the iceberg. Prepare talking points and slides to explain the economic threat, and present them to the next permit hearing, private interviews with the local officials, reporters, editorial boards, civic groups and at rallies. The landfill industry repeats and repeats its false assurances to create the appearance of truth, and you will need to do the same to bring the facts to the fore.